Our brand new round table is designed for your indoor or outdoor, commmercial or residential use. The classic and contemporary desk impresses with its high living comfort. And aluminum column and base, plastic floor glides, rust-free and durable. silver color is neutral to complement most existing furniture. Contemporary design is exactly the right combination for your indoor or outdoor spot. Sit down and enjoy a cup of coffee or have a pleasant meal. With it, you will enjoy your happy time. Don't hesitate to buy it! 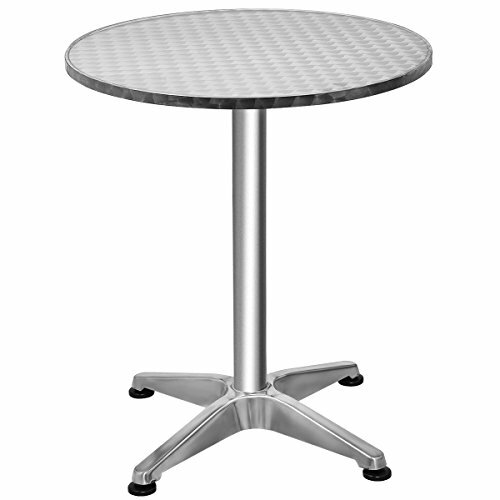 Giantex Bistro Bar Table: It is designed for your indoor or outdoor, commmercial or residential use. The classic and contemporary desk impresses with its high living comfort. Last Long Using: Aluminum column and base, plastic floor glides, rust-free and durable. silver color is neutral to complement most existing furniture. Also features high temperature tolerant, UV resistant and waterproof. Safety Use: Designed with plastic floor glides, prevent your floor from scratch. Lightweight build, you can rearrange or put into storage easily. Convenient Use: Large round table top provide enough using space, Lightweight build, you can rearrange or put into storage easily. Contemporary Design: Contemporary design is exactly the right combination for your indoor or outdoor spot. Easy to assemble and all the hardwares are packed. Easy to clean for daily use.